Service is fast, efficient and affordable when you choose Charlotte Dumpster Service. We offer flat fees which cover the entire length of your rental time. Extensions are also available should you need dumpster service beyond the agreed-upon time. Our waste management dumpster rental provides containers capable of carrying light or heavy loads. Dumpster Sizes are available in 10, 15 and 20-cubic yard varieties. We also offer both open-top or walk-in gate dumpsters to ensure you have the exact dumpster that meets the needs of your specific job. Our team of customer associates will work with you to get the right size dumpster to you as promptly as possible. Scheduling your next job with Charlotte Dumpster Service is made easy with a simple process in which we specialize in catering to each specific client. Dropping off and picking up each waste management dumpster rental is completely in our hands as we work to fit your schedule. There is more to Charlotte Dumpster Service that mere rentals as quality customer service has made us a top choice in dumpster rental throughout the Charlotte area. Homeowners, business owners, contractors and construction companies can all take advantage of our long line of top notch services. 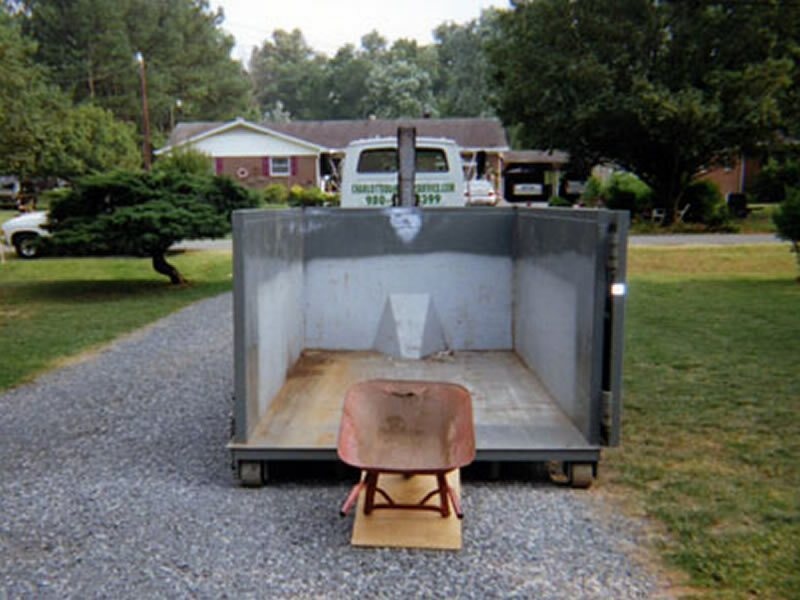 At Charlotte Dumpster Service we give you the dumpster rental service you deserve. New Home Builders, Commercial Builders, Remodelers and Contractors to spring cleaning and junk removal, we pride ourselves in building relationships through our professionalism, experience, and care. Our containers are solid, clean and ready for light or heavy loads. Whether you are hauling, demolishing, remodeling, or doing site work, we offer quality rental dumpsters to keep your project on track. At Charlotte Dumpster Service our customers come first. We offer flat-rate rental pricing plus extensions when needed. Satisfaction is our first priority! Open Top or Walk-in Gate for Specific Needs. Charlotte Dumpster Service is willing and waiting to meet any unique request. From delivery to pick up, we keep our dumpster rental service as easy as possible in order to keep your project moving along. We work within your schedule, where and when you need us most. Efficiency is our primary goal; Charlotte Dumpster Service must be up to date on North Carolina State Container Laws. We will explain the dumpster laws so you understand and are comfortable with our practices. To stay in compliance with North Carolina, we have to prohibit certain trash and debris in our roll off containers. Please call for a list of acceptable and unacceptable junk, trash, waste and debris, 980-428-3399.